It's a non-stop firefight as Cobra defends Broca Beach from the invading Blue Ninja forces. Baroness and Snake Eyes target the Blue Ninja master, who himself confronts Cobra Commander for a final showdown. 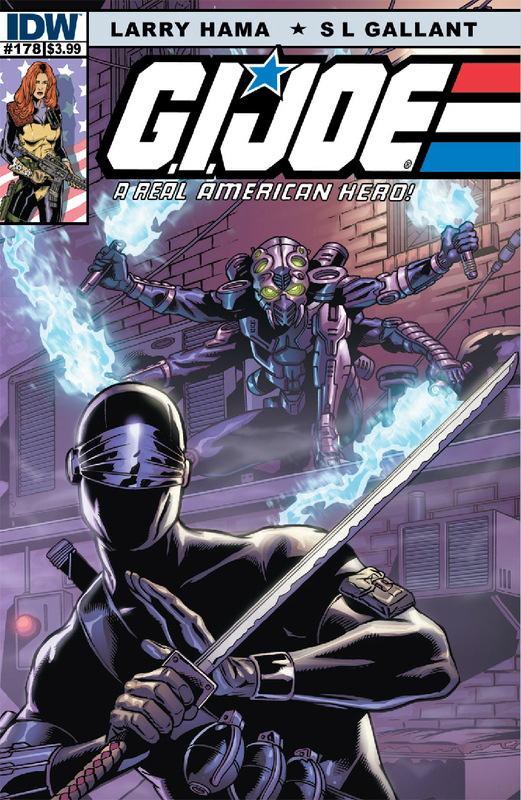 Hama and Gallant's GI Joe: A Real American Hero #178 is another strong, and fun, chapter in the classic Joe mythos. Larry Hama's Blue Ninja storyline has been building up for the better part of a year, and now we are reaching the climax. All the major players are in or approaching Broca Beach, and all hell has broken loose. Hama keeps the action focused on the Baroness and Snake Eyes, who continue to work as a perfect team that no one anticipated. Hama keeps the plot moving quickly. We got the opening salvos of the fight last issue, and we conclude this issue with the Blue Ninja Master, BN-011, coming face-to-face with Cobra Commander in his battle uniform. Hama also keeps the perspectives moving quickly, too. Not only do we concentrate on the Baroness on the streets and the Commander's forces in the Wax Museum, a new front opens up on the shores of Broca Beach, while two more players are on the outskirts of Broca Beach looking to add to the mix. As bad as the situation seems for my beloved Cobra forces, Hama plays it fair, and has been dropping hints these last couple issues that the Blue Ninja's apparent success so far may all be a ploy by Cobra Commander. The showdown between CC and BN-001 has me eagerly anticipating the next issue. Hama still does the Baroness justice in this issue, making her ruthless, cunning, and extremely competent in the heat of battle. I'm rather disappointed, however, that the rest of the Cobra forces don't seem to be pulling their own weight in this battle. True, the Blue Ninja have that critical advantage of the element of surprise, but I would think that the armories at Broca Beach would have the firepower to mow down any invading forces, no matter how well armored and ninja-fied. We've been witnessing the battles on the streets from the viewpoints of the Baroness and Snake Eyes, so it's difficult to assess the relative causalities on both sides. But from what we've seen, the Cobra grunts seem to be taking a beating. And the Cobra fan in me is a little upset by this. Of course, we know that Cobra Commander is aware of the Blue Ninja's network infiltration, and Cobra has been feeding false information to the Blue Ninja, so here's hoping Cobra's apparent ineptitude is part of that deceit. What can I say about S.L. Gallant's art that I haven't already gushed about in previous reviews? He continues to provide the clean, dynamic illustrations that perfectly complements Hama's plotting. I especially enjoyed those silent sequences of panels where the Blue Ninja board the cargo ship. Just that sequence alone made me want to see Gallant take a stab at a silent issue sometime soon. I am so enjoying this all-out battle between the Blue Ninja and Cobra that I was actually disappointed to see the Joes appear half-way through the book. A fun, entertaining, and action-packed issue, with hints that the best is yet to come. Highly Recommended.